All download files are self-installing applications. Detailed installation and setup information is contained in the download, and additional installation instructions are contained within the Setup section of the manual, so you may want to install download the manual from this website. All documentation is in PDF format, so you may need to download Adobe Acrobat Reader from www.acrobat.com. Each download also comes with a README, which is displayed when you install the application. 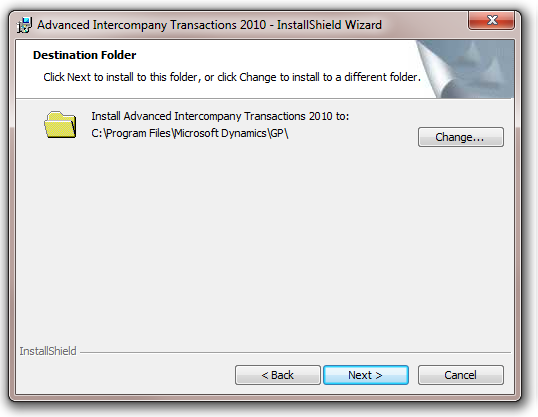 READ THE INSTALLSHEILD PROGRAM AND SETUP WIZARD ON-SCREEN INSTRUCTIONS CAREFULLY TO HELP ASSURE A SUCCESSFUL INSTALLATION! Choose the option that is appropriate for your situation. 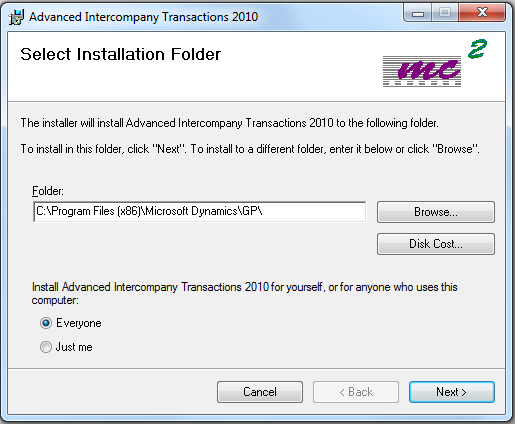 If you receive this error, you will need to uninstall the mc² application from the Control Panel (Add/Remove Programs on Windows XP or Programs and Features on Vista, Windows 7 or higher). This will not impact any of your Dynamics GP or mc² application data. It simply makes sure that the new installation will start from a clean slate. 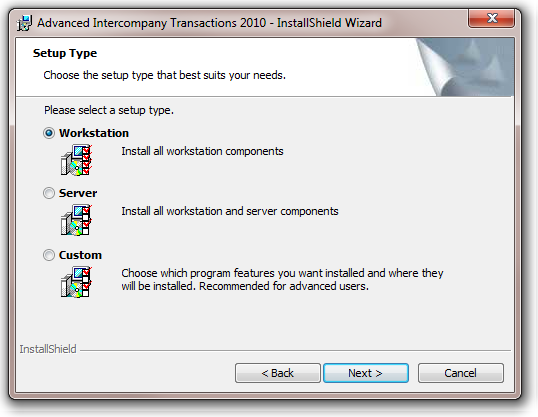 Choose the Server Install or SQL Script Files and run the Setup Wizard on the first workstation or server installation. READ NOTES TO PREVIOUS BUILDS. IF YOU ARE UPDATING FROM A MUCH EARLIER BUILD, YOU MAY NEED TO RUN THE PROCEDURES THAT WERE REQUIRED FOR ANY BUILD IN BETWEEN YOUR PREVIOUS BUILD AND THE NEW BUILD. This means that if between your old version and new version the download instructions included check links and reconcile before installation, you must run that process. 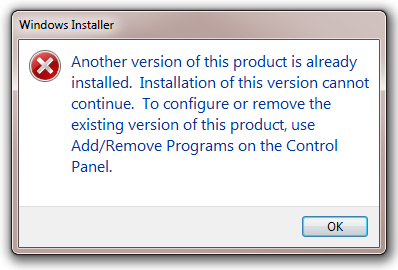 You need to install only the latest build, but you must run any procedures that were mentioned between builds. If notes for your particular build indicate that you need to run the mc² Setup wizard, please read the installation instructions contained in the manual. NEVERY COPY THE \SQL\MC2 FOLDER FROM ANOTHER LOCATION. THIS WILL POTENTIALLY CAUSE PROBLEMS BOTH DURING THE SETUP WIZARD, ENTERING DATA AND POSTING, AND CAN POTENTIALLY DAMAGE YOUR DATA. If you have modified any reports contained in an mc² application, you may need to recreate the reports. Refer to Related Articles for more information. When you launch Dynamics GP, you will be prompted to include new code. Click Yes for both server and workstation installations. If you get a privileges error, then security to the GP installation is restricted and you will need to launch GP using the “Run as Administrator” option. You will then be asked if you want to Setup AIT. This will automatically start the AIT Setup Wizard upon login, so do this only if you are doing a server/first workstation install and have chosen to install the SQL Script files. 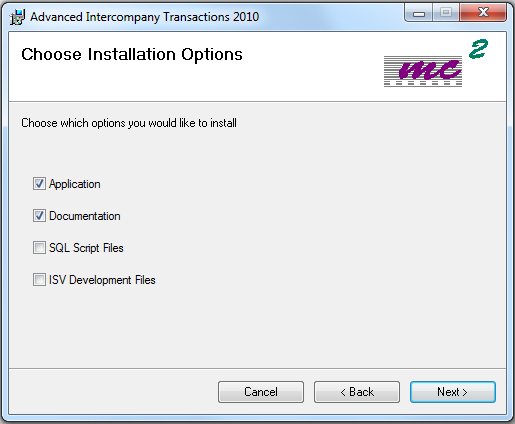 Click Yes only if you have chosen a server/first workstation installation. You do not need to run the AIT Setup Wizard more than once for each site. If clicking Yes does not automatically start the AIT Setup Wizard on login, make sure your Defaults File (dex.ini) is not read-only.